A byte is a unit of information in computing. Generally, 1 byte consists of 8 bits and can express 8 binary digits (i.e. 256 types) of information. 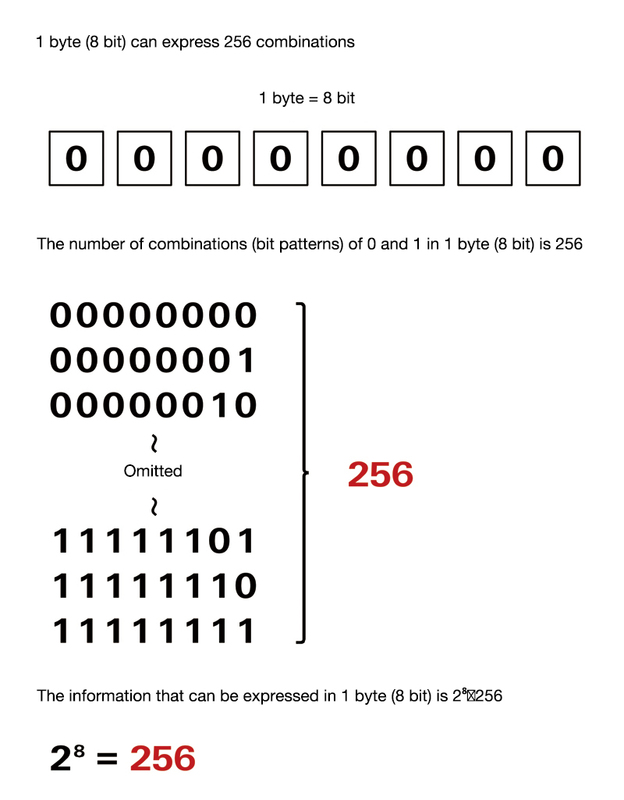 If used to express whole numbers, a single byte can express 256 whole numbers (e.g. 0 to 255, -128 to 127, etc.). If used for text, 256 types of characters. If used for the colors of bit map data, 256 colors. The size of computer data is usually indicated using bytes and this size depends on the type of data. For example, the size of text data containing 500 single-byte characters would be 500 bytes. The size of the actual data for an image comprising a 5 x 5 pixel bit map data containing 3 bytes of color information in each pixel would be 75 bytes. A byte is also the unit used to indicate the capacity of a memory device such as a hard disk, main memory, CD-R or USB flash memory. Prefixes such as kilo (K), mega (M), giga (G) and tera (T) are used to denote large-sized data or storage capacity and these would be labeled 256MB (megabytes), 500GB (gigabytes) etc. according to the actual size. 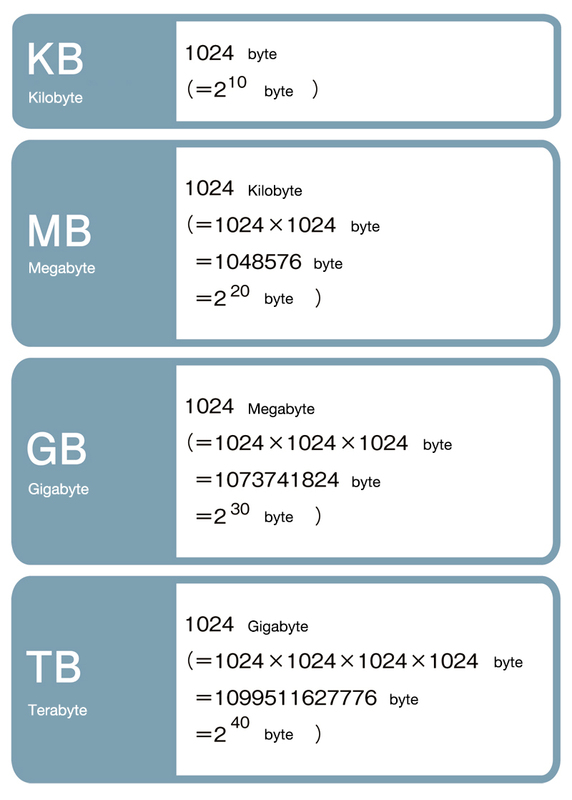 1KB is 1024 bytes (or 1000 bytes in some cases) and each time this is multiplied by 1024 (or 1000 in some cases) the prefix changes to mega (M), giga (G), tera (T) and so forth. For example, a 500GB hard disk has approximately 500,000MB of capacity. This is equivalent to the capacity of more than seven hundred 700MB CD-Rs. A 700MB CD-R can store seven hundred 1MB images and a 500GB hard disk can store more than 500,000. It is advisable to be aware of the size of the data in daily use and their relationship to the capacity of the memory devices. On rare occasions, 1 byte could mean something different to 8 bits. Therefore, a unit called octet is sometimes used to indicate explicitly that one is referring to 8 bits.